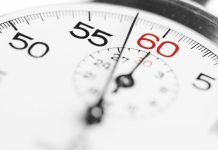 Home Training Articles Kata and Bunkai Kata Naihanchi – Karate’s Most Deadly Kata? The kata Naihanchi (Tekki) is practiced within the majority of karate styles. The word ‘Naihanchi’ is said to mean ‘sideways fighting’ due to the kata’s distinctive embusen (floor pattern). This embusen often leads to many karateka incorrectly believing that the kata is for fighting on a boat, or when your back is against a wall etc. As we shall see later, the sideways steps in the kata have nothing to do with fighting on boats and everything to do with effectively incapacitating an opponent. In Shotokan the kata is referred to as ‘Tekki’, which translates as ‘Horse riding,’ presumably named after the stance from which Shotokan practitioners perform the kata. In the past, Naihanchi was often the first kata taught but today it tends to be introduced at brown belt level. Naihanchi is not visually impressive, there are no flamboyant techniques or fancy jumps, and as a result few students enjoy practicing it. The kata is unlikely to win any trophies and is usually begrudgingly learnt and practiced in order to satisfy grading requirements. I personally believe this to be a great shame as it is my view that the kata has a great deal to offer the karateka. It was Sokon Matsumura (1796-1893) who is said to have brought Naihanchi into karate. Matsumura fused the indigenous Okinawan fighting art of Te with various methods of Chinese kempo to form what became known as Shuri-te. Such were Matsumura’s fighting skills that he was appointed as both bodyguard & martial arts instructor to three successive kings of the Ryukyu Islands. Matsumura fulfilled this role until the monarchy was dissolved in 1879. In an additional recognition of his fighting prowess, Matsumura was often referred to as ‘Bushi (warrior) Matsumura’. As well as his bodyguarding duties, Matsumura occasionally visited China as an envoy on affairs of state. Whilst on these trips he would study kempo from the Chinese military attaches and visit local martial arts schools. It is possible that Matsumura was first introduced to Naihanchi whilst on one of these trips. He may also have received instruction in the kata from one of the many Chinese martial artists who visited Okinawa. Among Matsumura’s students was ‘Anko’ Yasutsune Itsou (1830-1915) who was also employed by Sho Tai (the last king of the Ryukyus) in the capacity of a scribe. Itsou specialised in Naihanchi and believed that it was both, “the easiest and hardest kata to learn”. Itsou developed and revised many katas and it was he who created the Nidan & Sandan versions in addition to giving the original kata its Shodan suffix. Today, some styles practice all three versions (e.g. Shotokan) and others just practice the original (e.g. Wado-ryu). It is said that the two Naihanchi kata created by Itsou were specifically designed for teaching to school children and hence do not contain the more dangerous techniques of the original. 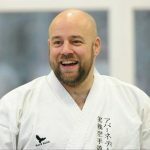 It is more likely that the Nidan & Sandan versions are variations on a theme and still contain many effective fighting techniques (if you know where / how to look). However, Hironori Otsuka (founder of Wado-ryu) believed the Nidan and Sandan versions to be, ‘almost useless’ and this is probably why they are omitted from the Wado-ryu syllabus. 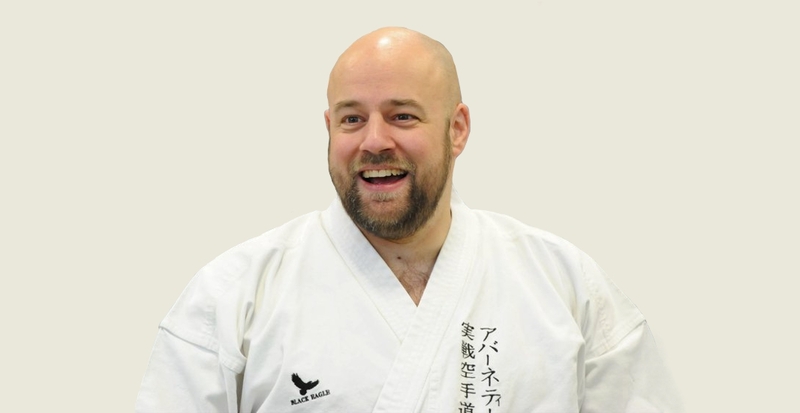 In contrast to his dislike of the Nidan and Sandan versions, Otsuka stated that the original (Shodan) was his favourite kata. It was in 1901 that Itsou placed Karate on the Physical education program for Okinawa’s school children. Itsou believed that karate was far too dangerous to be taught to children and set about disguising the highly effective techniques the various katas contain. As a result of these changes Itsou taught the katas to the children as mainly punching & blocking. This is significant when looking at Naihanchi (and indeed all the katas) as the majority of modern karate uses Itsou’s terminology; hence the label given to a technique has no baring on its intended application. Itsou was one of the teachers of both Kenwa Mabuni (founder of Shito-Ryu) and of Gichin Funakoshi (founder of Shotokan). In his writings, Funakoshi informs us that Itsou required him to practice each version of Naihanchi for over three years. It is a good indication of the kata’s importance when you consider that the first decade of Funakoshi’s training revolved solely around Naihanchi. 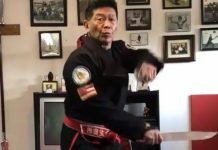 It is my belief that Naihanchi contains many highly effective techniques & concepts that are of great value to today’s martial artists. Few modern day students value the kata due to its simplistic appearance and hence fail to give it the attention it deserves. As mentioned earlier, this situation is not helped by the fact that many instructors explain that the kata is for use when fighting on a boat, or on the raised land between paddy fields etc. Such explanations are unlikely to inspire the student to value the kata, as few are likely to find themselves in such bizarre circumstances. All the sideways steps in the kata are there in order to position you to strike an opponent who is now off centre due to the preceding technique, or to move you inside the effective range of an opponent’s strike, and have nothing to do with fighting around paddy fields! It must be understood that each kata was intended to be applied as a stand alone self-defense system and were not designed to be used in conjunction with the others (although there is no reason why they could not be). 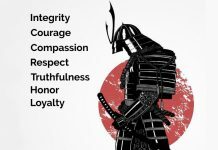 Each kata records the fighting techniques and principles of the person who created it. It is ridiculous to suggest that the creator of Naihanchi was a ‘paddy field fighting specialist’, that a warrior like Matsumura would be even remotely interested in such methods, that Itsou would specialist in these methods and then insist that his students spend a decade perfecting techniques for such a remote possibility. It is far more probable that Itsou believed Naihanchi to be so effective that even if it was the only thing the student ever learnt they would be an able fighter. Choki Motobu was his father’s third son and as such was not permitted to study the family system (Motobu-ryu) as this was the sole reserve of the first born male. Motobu was keen to learn how to fight and would try to pick up what little he could by spying on his father and older brother. This proved frustrating and Motobu decided to train on his own using a makiwara and large rocks for weights. Motobu developed great strength and earned the nickname of ‘Saru’ (monkey) due to his agility. Motobu was uncontrollable as a child and upon reaching adulthood would often pick fights in order to test and develop his skills. Motobu did gain some formal instruction from the likes of Soken Matsumura, Tokumine, Kosuku Matsumura and Anko Itsou; however, his relationship was always strained with his teachers due to his constant desire to prove himself. It was this aspect of Motobu’s behavior led to him being expelled from Itsou’s dojo. Motobu played a large part in publicizing karate after he defeated a European professional boxer in Kyoto in 1921. Motobu decided to enter after his landlord showed him an advert requesting challengers. It is said that Motobu dodged his opponent’s punches before quickly moving forwards and knocking the boxer out cold with a single strike. The audience was amazed at how easily Motobu had defeated the boxer and news of the bout spread quickly. The Japanese people were very keen to learn more about the hitherto unknown art of karate, and as a result Motobu became a full time instructor. Despite his reputation, it is said that Motobu was well spoken and instilled in his students the importance of good manners. Motobu was undoubtedly a most able fighter and what is interesting about him – with regards to this article – is that the kata he emphasized in his teaching was Naihanchi. This could be dismissed as unimportant as some say Naihanchi was the only kata he knew (others say he also knew Passai). The fact that Motobu only knew one or two katas is not unremarkable as at that time it was very common for karateka to specialist in this way. Although the masters of old would only know a few forms, they understood them in great depth and had the ability to apply them. Today, of course, the situation is quite different with even relatively low grades knowing several katas. This is not necessarily a bad thing as it ensures karate does not lose any of its heritage, but it would be prudent to pick one or two favorite forms (Tokui) to study in depth. Motobu was undoubtedly a pragmatist who took his fighting seriously. What must be considered is that Motobu’s students studied under him to improve their fighting and he obviously regarded the study of Naihanchi as a vital part of learning how to fight. If this were not the case it is extremely doubtful that a fighter like Motobu would have bothered to learn the kata in the first place and he certainly would not have taught it to his students if he believed it to be of little value. Motobu is said to have taught many grappling and throwing techniques extracted from Naihanchi. Such techniques are rarely seen among the unrealistic applications often associated with the kata today. One technique of particular interest is the ‘Nami-Gaeshi’ or returning wave kick. The application commonly attributed to this movement is a blocking or deflecting movement in response to a kick, or the avoidance of a sweep. None of those applications are particularity effective or relevant to a self-defense situation against opponents who are extremely unlikely to be other karateka. Although in some styles the foot comes higher, in the majority of styles the foot comes to the inside of the knee joint. The purpose of this is to show the kata’s practitioner exactly where the kick should be directed to upon the opponent’s legs. In some Okinawan karate styles stamping to the inside to the opponent’s knees is even referred to as ‘Naihanchi-geri.’ It is said that Motobu once used the stamping kick from Naihanchi to break one of his opponent’s legs. There should be no doubt that close range fighting skills are vital when it comes to defending yourself. Naihanchi provides instruction on close range fighting; the techniques are also direct and relatively easy to apply. 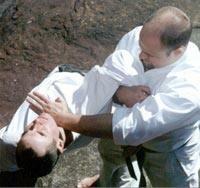 We can also see the integrated use of striking and grappling, which is the key to success at close range. A look at the applications from the opening sequence of the kata reveals how effective the form is. Every single move has the potential to disable an attacker and when used in combination (as the kata teaches) may very well be fatal (this sequence is illustrated on, “Karate’s Grappling Methods Vol.1” video). The first move of the sequence positions the defender inside the effective range of the attacker’s punch. The strike is delivered to the Carotid Sinus, which will result in unconsciousness due to the brain misinterpreting the blow as high blood pressure and the body taking action to protect against cerebral hemorrhage. (Even a violent push to this area can result in unconsciousness). The pull on the right arm will throw the attacker’s left shoulder back and hence prevent the throwing of an effective follow up punch should the defender’s initial strike fail to incapacitate. The pull will also increase the impact of the defender’s strike. Should the opponent only be dazed the defender’s right hand will secure the opponent’s head so that an elbow strike can be delivered to the base of the skull (optical bone). The Cerebellum will be concussed resulting in disorientation and lack of motor function. A powerful blow could prove fatal due to the skull being dislodged from the spinal column. The opponent’s head is then seized and wrenched down to the left using the hair, or ear if the hair is short. This twisting of the neck in two directions at once can result in serious damage. A punch is then delivered to the jaw which, should the opponent still be functioning, will shake the brain and knock the opponent to floor. As the opponent falls to the floor, the defender repositions themselves by stepping across (not a paddy field in sight!) before stamping on the felled opponent’s skull. The stamp is greatly emphasized in Shotokan due to the high leg lift. The whole combination takes seconds to perform and contains a number of highly dangerous techniques. Obviously, each technique can be effective in isolation but when used in combination the effects would be devastating (and would only be justified in the most extreme of circumstances). These first few moves give a flavour of the effectiveness and severity of the applications of Naihanchi. The methods and techniques of Naihanchi are highly potent and worthy of deep study. Whether techniques are visually impressive or not should never be a consideration, the only thing that matters is whether the techniques will incapacitate the opponent. Naihanchi was a part of the methods of Matsumura, Itsou, Funakoshi, Otsuka, Motobu, Mabuni etc. all of whom were able fighters. If you only wish to impress others with your kata then practice of Naihanchi will bring little reward. However, if you require effective close range fighting skills and you wish to follow in the footsteps of some of karate’s greatest masters then Naihanchi and its applications should be practiced relentlessly and studied deeply.